Product #1842 | SKU 627 | 0.0 (no ratings yet) Thanks for your rating! Basic adapter that can mount on top of a head monopod or tripod. The Manfrotto 627 - Basic Panoramic Head Adapter can be mounted on top of a head, monopod, or tripod. 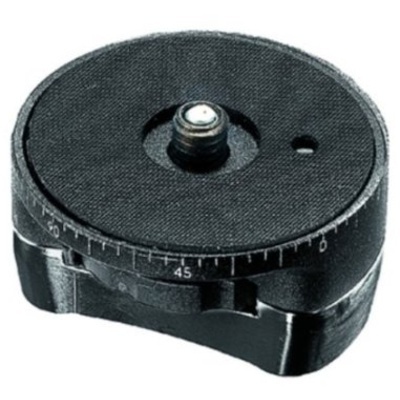 The adapter camera platform has a graduated scale in millimeters to set the camera position during different shooting sequences and a dual 1/4' and 3/8' camera fixing screw. This accessory can be connected to a head, monopod, or tripod by a 3/8' female attachment. Can be connected to a head, monopod, or tripod by a 3/8" female attachment. Retractable 1/4 and 3/8" screw attachment type on the top. Female 3/8" thread attachment type on bottom.